Other photos: Photo 1, Photo 2, Photo 3, Photo 4, Photo 5, Electric sunroof w shade, Galley w Full Size refrigerator, Photo 8, Photo 9, Master, Master Bedroom Washer/Dryer Combo, Photo 12, Photo 13, Huge Separate Guest Shower, Photo 15, Photo 16, Photo 17, Photo 18, Huge engine Room, Photo 20, Photo 21, Photo 22. FRESHWATER ALWAYS!!! *Only 525 Hours On Volvos *Upgraded Fusion Stereo w Amp and Sub, 2 fixed controls @helm and swim deck w ( 4) Rooftop JL Bazooka Tubes *Garmin Muiti Function Touch Screens Displays *Underwater Lights Multi -Colored controlled by Wifi Smartphone App * New Forward Sunpad *Direct TV Sat *Hydraulic Swim Platform * Huge retractable Sunroof *All Service Records since New *Tender Chocks *All Props Tuned/Scanned Jan 2019 *Drives/Oil /Fuel Filters Serviced Jan 2019 *Always Heated indoor storage in Winter * Never seen saltwater! *Weekly Washed thruout season *Seasonally Waxed *Yacht Management Maintained *Currently in heated storage *More pics coming soon The stylish 48 Cantius, with Volvo Penta IPS propulsion premiers the ingenuous integrated design of the upper helm and lower salon, plus its sleek design features standard amenities such as a walk-thru windshield, dual entrance cockpit and upper and lower salons. AFT DECK - Designed for entertaining, the cockpit of the 48 Cantius comes fully equipped with a refrigerator, ice-maker, grill and abundant storage. U-shaped seating easily converts to a comfy sun lounge, both port and starboard entry to the cockpit from wide 15" side deck landings. With no canvas to fret over, seating and the table come with convenient all-weather slip-on covers. HELM- This cutting edge navigational center offers complete views and unique command of the vessel and monitoring of the twin Volvo Penta IPS 600 engines. Volvo Penta IPS engines with joystick maneuvering are standard, and ensure more efficient and responsive handling. Standard is a double helm seat featuring a flip up bolster. An optional electric single helm chair is also available.. A large walk-through windshield is optional, with a single windshield wiper and a manual opening air vent on the walk through door. Windshield comes with a blackout/privacy screen that attaches from the outside to complement the easy pull-down shades throughout the inside of the remainder of the helm area. UPPER SALON: The 48 Cantius' double salons are designed to invite on-board entertaining. The upper salon can easily host six guests and comes standard with a wet bar including sink, a 32" Sony Bravia TV, a power-actuated 71" by 71" sunroof with manual sun shade and tri-slide upper salon glass door for 360-degrees of visibility and 165 square-feet of enclosed glass. Also standard, a double helm seat, featuring flip-up bolsters and companion seat. The companion seat converts to a lounge and offers a multi-functioning dinette table. Below deck, the traditional disconnect between the upper helm and lower salon no longer exists. The lower salon features a standard L-shaped sofa with an optional pullout sleeper or side-by-side incliners that offer seating for six and is complemented by a 32" Sony Bravia TV and a 20" by 36" dinette table.r. GALLEY: At the galley's entrance, raised ceilings offer just under 7' of headroom. The inventive port side galley is furnished with an upright stainless steel refrigerator and freezer, microwave/convection oven, electric stove, double sink and plenty of storage for supplies. A standard 15.5 kW generator supports four air conditioning and heating units to keep you comfortable. And extra-large below-deck hull ports amplify visibility in the galley and are frame-less and post-glazed for a deeper, richer aesthetic. MASTER STATEROOM:With 6'6" of headroom, the full-beam master stateroom features a queen-sized island berth with a therapeutic foam mattress accessible from both the port and starboard sides. Two full-length cedar-lined closets and a large built-in dresser on the starboard side offer ample storage, perfect for long cruises. Boaters have the option of adding a washer/dryer combo in the port closet. 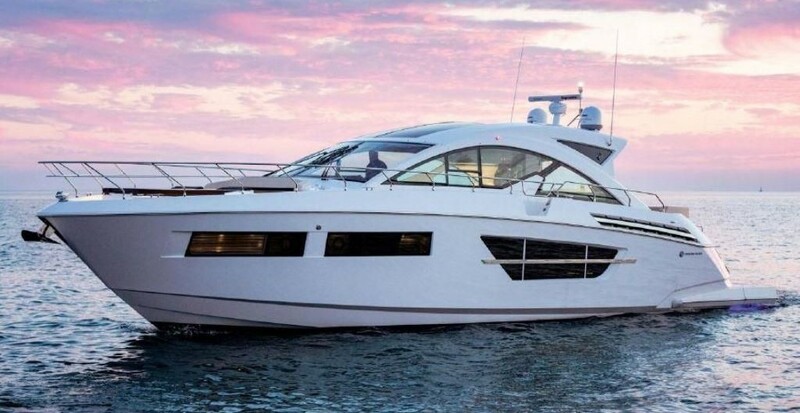 Elegant amenities are what give Cruisers Yachts style and legendary comfort and the 48 Cantius is no exception. The forward stateroom boasts a queen-size island berth accessible from either the port or starboard side, with storage below, and private access to both the head and shower. Two built-in full-length cedar-lined closets provide additional storage. MASTER HEAD - The master stateroom also offers a private head with separate shower stall. A large vanity sits outside the head compartment with solid-surface counter-tops, and storage above and below. Hull ports above the vanity and built-in dresser capture natural light, illuminating the massive master stateroom. FORWARD STATEROOM & HEAD - The master stateroom also offers a private head with separate shower stall. A large vanity sits outside the head compartment with solid-surface counter-tops, and storage above and below. Hull ports above the vanity and built-in dresser capture natural light, illuminating the massive master stateroom. Guests will appreciate the private entrances to the day head and split shower from the stateroom. Plus, the day head is also accessible from the lower salon. SYS Yacht Sales is pleased to assist you in the purchase of this vessel. This boat is centrally listed by YachtSalesInternational.Com.